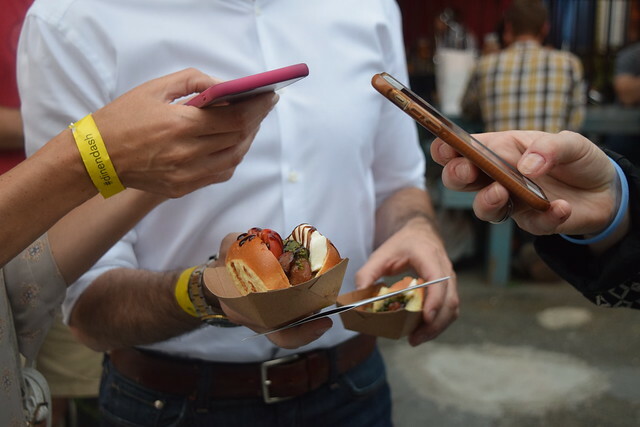 On the surface, Dine N Dash is a foodie’s dream—great food and drinks, some of the hottest D.C. chefs, and the chance to try it all in one night. So naturally, I was excited to attend for the first time. Dine N Dash benefits World Central Kitchen, Chef José Andrés’ charity which develops smart solutions to hunger and poverty worldwide. This year, the event expanded from Penn Quarter to the 14th Street corridor, incorporating 30 restaurants and food trucks. We were assigned to start at Birch and Barley, so we ate our way through 14th Street. After a quick drink at Birch and Barley, we were eager to get started. 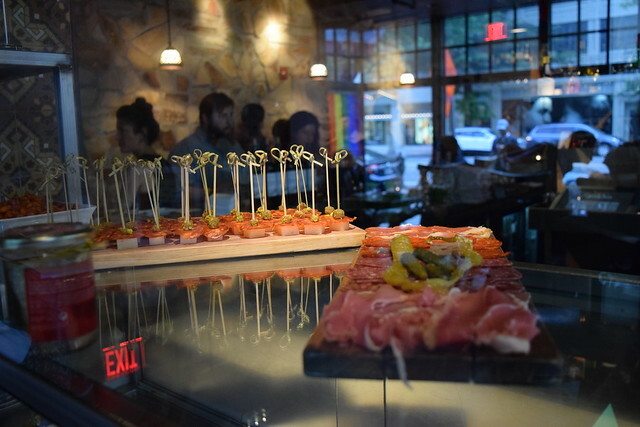 First up was Estadio, the cool Spanish tapas spot. I loved the charcuterie plates and spicy patatas bravas. The sangria was rather plain though, perhaps because it was being churned out for the large crowds. Next up was Ghibellina, which after really impressing us during the preview, we couldn’t pass up. 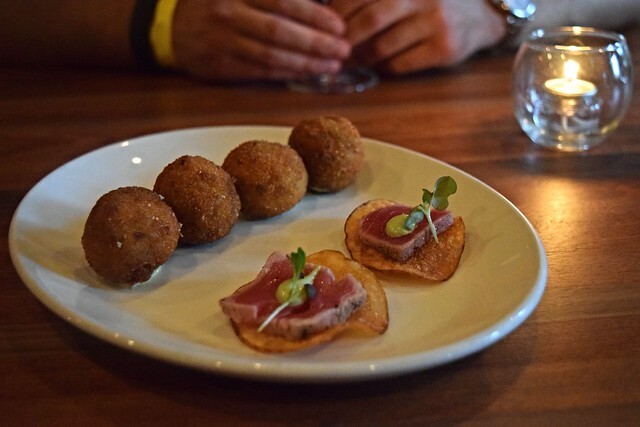 There we enjoyed those ramp arancini balls with pickled ramp aioli and the most incredible panna cotta. Seriously, I could have stayed there eating panna cotta all night. At Pearl Dive, we hung out on the patio to enjoy the beautiful weather and drinks. Pearl Dive had the best punch of the night, made with Pimm’s Elderberry liquor. After a couple glasses of that and rosé, we were ready to start noshing again. As expected, Pearl Dive brought its A-game with lots of oysters, and a yummy ceviche. I was surprised by the dessert options too, which included blondies and chocolate mini donuts. The patio was crowded at Barcelona. 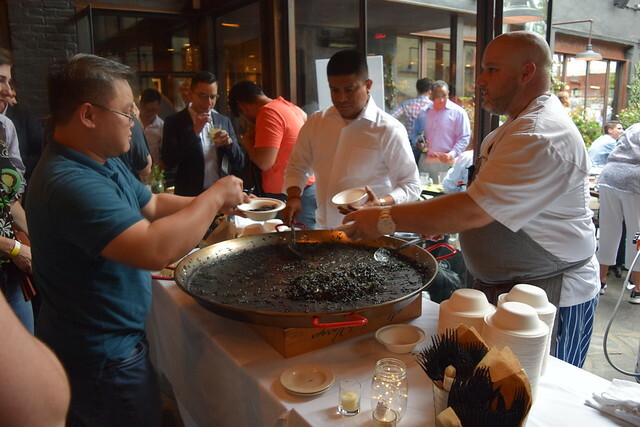 Chefs were stirring up an enormous pan of squid ink pasta that tasted like paella but without shellfish. It wasn’t my favorite, but everything tastes better with white sangria. We were sure to grab a croquette on the way out. Our final restaurant of the night was Doi Moi. Andrew devoured the gluten-free mango salad, with herbs, carrots, chili, toasted rice powder, palm sugar, and crispy shallots. 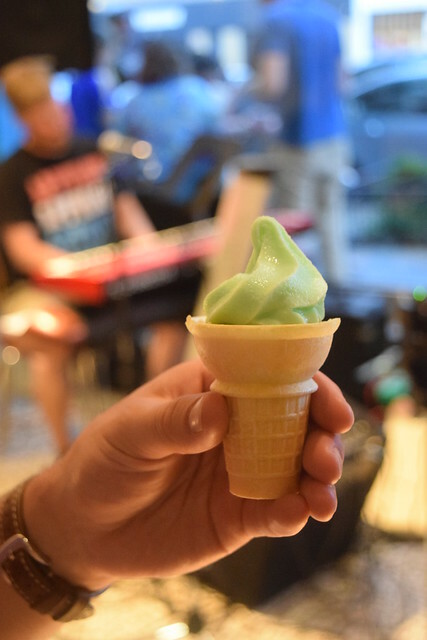 But the MVP dish of the night was the green tea soft serve ice cream. It served as an excellent palate cleanser and was fun to enjoy a cone while listening to the three piece band Doi Moi hired for entertainment. Finally, we hit up the food trucks to polish off the night. We saw people fighting over who could get the better Instagram of Swizzler hot dogs (the winner of the Dine N Dash Instagram contest won brunch at Zaytinya, so I don’t blame them). 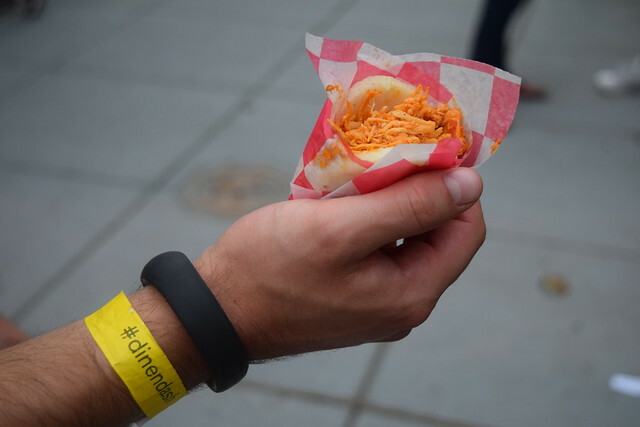 I finally got to try the chicken arepa from ArepaZone, which also has an outpost in Union Market now too. VIPs also got access to Cork, Le Diplomate, and the after party with Andrés and Erik Bruner-Yang. But after all that eating, I was ready for roll over into a food coma—I couldn’t even bring myself to scoot over to Penn Quarter to try the rest of the restaurants, as I had initially intended. Overall, the event is a little overwhelming, but a great way to try a bunch of very different restaurants. Crowds are sporadic and there’s no real hurry, although I wish we had lingered longer at some spots. It’s a fun way to meet people too, since the crowds make it so you have to get friendly and share tables with strangers. We’d definitely recommend as a fun date night activity.